Sorry about the radio silence last week. I was just back from Bouchercon, was up to my eyeballs in getting LAMENT THE COMMON BONES ready for our early readers, and three out of four of our cats were freshly vaccinated and not all were doing well. But I’m back on track and ready for an update on the past few weeks. Bouchercon: Bouchercon 2017 was a great success. Louise Penny was, as always, a standout Guest of Honour. As popular and well-known as she is, she’s still gracious, funny, and down-to-earth. She talked about the loss of her beloved husband Michael with honesty and love, had insightful stories about her early days of writing and what she’s learned over the years, and had endless time for fans at all of her signings (each one that went on for hours at a time). The conference was in a great location, was well organized, and had something for everyone from fans, to beginning writers, to battle-scarred veterans. Personally, I had a great time. My panel on the Critters of Crime was a blast, and a special thank you goes to moderator Michael Kurland, and fellow panelists Margaret Mizushima, Janet Finsilver, Eileen F. Watkins, and Kelly Oliver. 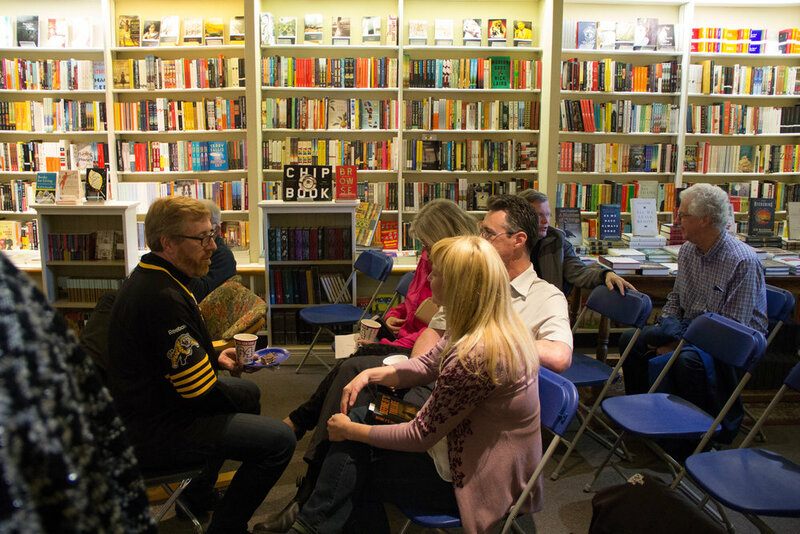 It was great to get together with fellow Crime Writers of Canada authors, who were extremely well represented. 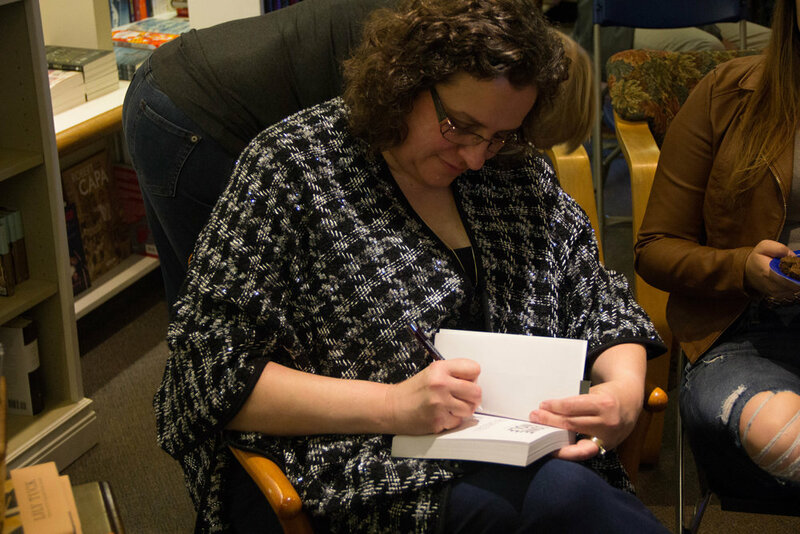 Kensington also had a significant presence and we had an extremely popular author signing. It was a pleasure meeting so many authors I’d only interacted with on-line, as well as new readers. The Kensington authors even had a fun outing to the Penguin Random House head office in Toronto for a lovely wine and cheese open house. I came home from the conference pretty tired, but very satisfied with my time away. LAMENT THE COMMON BONES: Back home again, my husband Rick and I continued to work on getting LAMENT ready to go out to early readers. Rick has put an immense amount of time into all the persnickety formatting that is required for CreateSpace as well as for .mobi and .epub file production. Thanks also to my daughter, Jess, the artistic mind and the skills behind putting the full cover together while dealing with CreateSpace’s finicky requirements and tackling the project every time we were slightly off target. I’m happy to say that the print copy is now ready to go. A proof copy is ordered and once I’ve reviewed that, it’s ready to print and ship. Early readers and bloggers now have their advance copies and we’re looking forward to early reviews in the coming weeks. We’ll also have buy links coming in the next few weeks. Newsletter: A new book coming out means that new editions of the newsletter will be coming out shortly. Want a sneak peak at the hit-the-ground running opening chapters that an early reader got sucked into today when she needed to get out and get things done (sorry, D!)? Then sign up for the newsletter at the bottom of the home page here at Skeleton Keys. FBI K-9s #3, STORM RISING: Our fantastic crit team has returned their copies of STORM RISING, so we’re back at work on the final finishing touches before the manuscript is due to our editor at the end of next month. They made some really great suggestions, and, fortunately, have no major plot issues, so we’re in good shape with time to spare to make sure the manuscript is squeaky clean before we hand it in. And just a reminder that Halloween is coming and when it comes to book or treat, we vote book! And may we suggest BEFORE IT’S TOO LATE as your book of choice? We continue to hold a 4.53 average on Goodreads and readers are loving it! 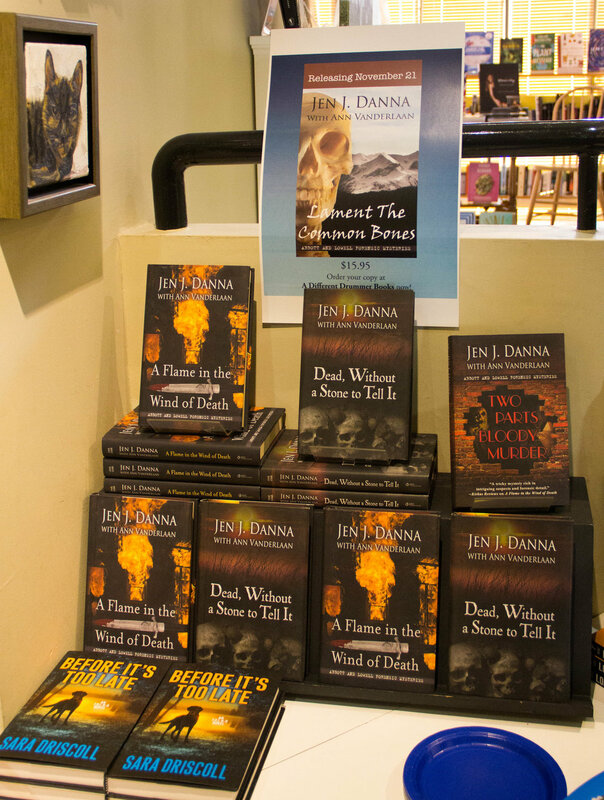 We’ve got some great news about the fifth book in the Abbott and Lowell Forensic Mysteries: it will release on Tuesday, November 21st. That’s only six weeks away! Why such short notice? Well, publishing is a business and LAMENT THE COMMON BONES got caught in the crossfire of a difficult business decision. 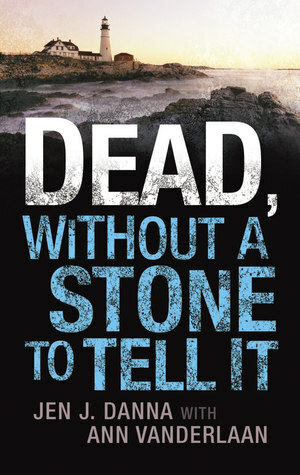 Five Star published DEAD, WITHOUT A STONE TO TELL IT, A FLAME IN THE WIND OF DEATH, and TWO PARTS BLOODY MURDER (we self-published the novella, NO ONE SEES ME ‘TIL I FALL). My editor read LAMENT THE COMMON BONES and loved it, saying it was our best Abbott and Lowell yet. The contract was even discussed. But then the publishing house made the decision to close down the entire mystery line and go forward only with westerns. That orphaned our book and the series. Hats off to our agent, Nicole Resciniti, who worked tirelessly to try to move the series to another pub house, but, realistically, selling the fifth book in a series when another house still has the rights to all the other full-length novels simply wasn’t possible. Once we knew that we had exhausted all our traditional options, we made the decision to self-publish. And since it was just our schedule that was the deciding factor around timing, we slotted it in after the launch of BEFORE IT’S TOO LATE and just before the manuscript of STORM RISING is due to our Kensington editor on December 1st. Thus, November 21st. We also felt our readers had waited more than long enough for this series installment, so sooner was definitely preferable to later. LAMENT THE COMMON BONES, out in trade paperback and e-book on November 21st! Buy links coming soon! 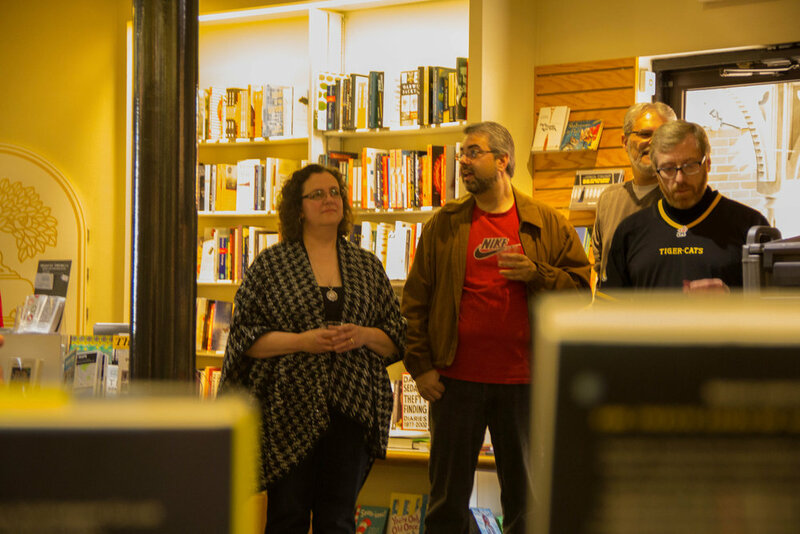 I was happy to celebrate the launch of BEFORE IT'S TOO LATE this past weekend with family and friends. 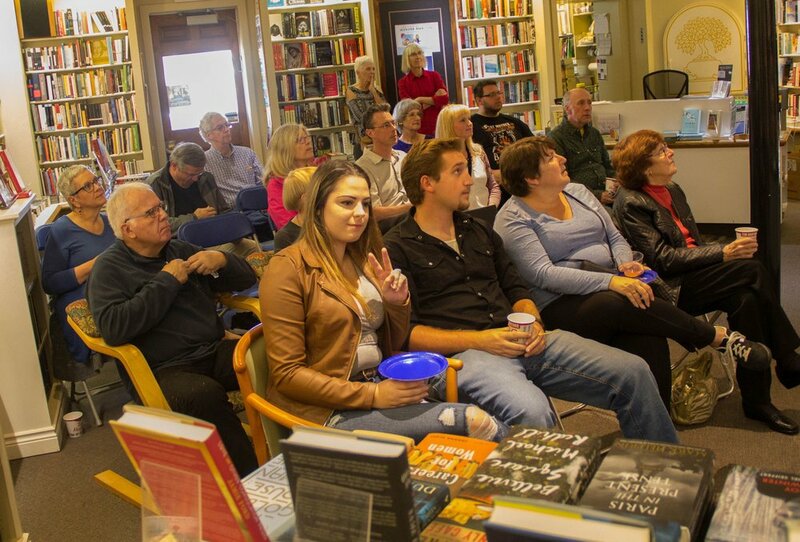 It was a lovely, intimate gathering at our wonderful downtown indie bookshop, A Different Drummer. 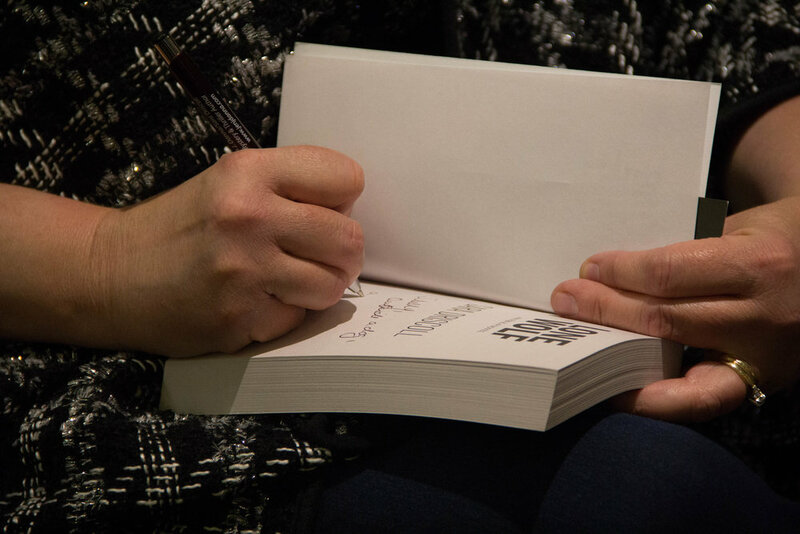 We've had some big, raucous launches before, but this one had more of the air of a dinner party where people lingered chatting and eating long after the reading. 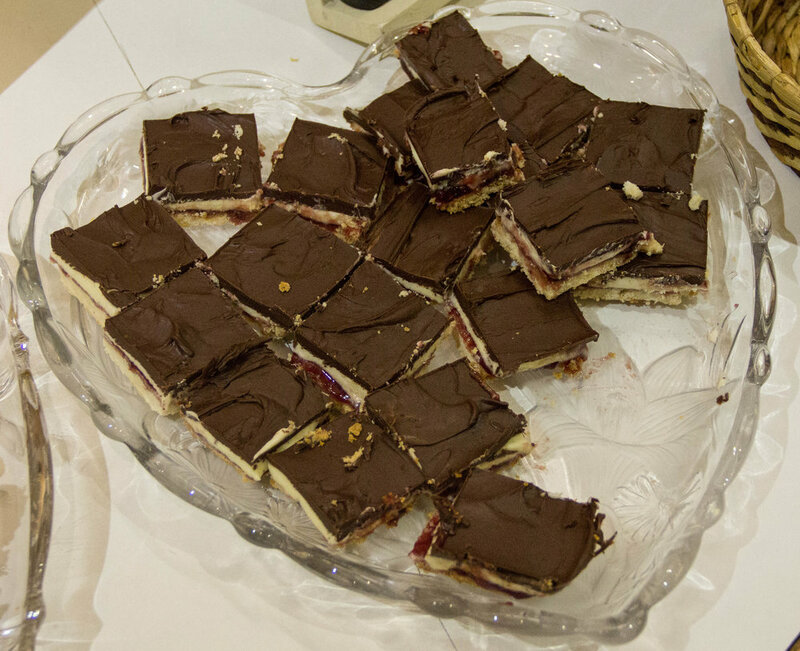 It was a really nice affair, and it gave me the chance to really spend time with people which was enjoyable and relaxing. Many thanks to all who attended! Many thanks for my older daughter, Jess Danna, for once again lending me her considerable photographic skills, and my younger daughter Jordan, for being my right hand and spending hours in the kitchen with me! BEFORE IT'S TOO LATE Is Out! Whoo hoo! It’s publication day!! Ann and I are happy to announce that BEFORE IT’S TOO LATE is now available. 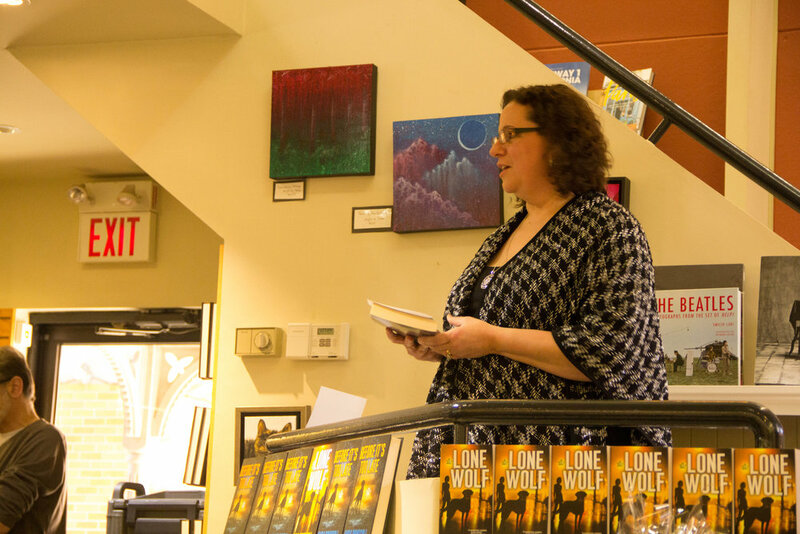 It’s been getting some great early buzz on Goodreads, and one of the comments we’ve noticed most is early readers saying that you don’t need to have read LONE WOLF to follow along. This is really great to hear because we really tried to write this second series installment as much as a standalone as possible because you never know where a reader’s entry point will be. In fact, I’ve seen many comments from people who intended to go back and read LONE WOLF based on the strength of BEFORE IT’S TOO LATE. BEFORE IT’S TOO LATE is available in hardcover and e-book (with the audio version coming in November) from these fine sellers: Amazon.com, Amazon.ca, Amazon.co.uk, Chapters/Indigo, B&N, BAM, IndieBound, Target, Walmart, Hudson Booksellers. Somewhere in the Washington, D.C., area, a woman lies helpless in a box. Beneath the earth. Barely breathing. Buried alive. In Quantico, the FBI receives a coded message from the woman’s abductor. He wants to play a game with them: decipher the clues, find the grave, save the girl. 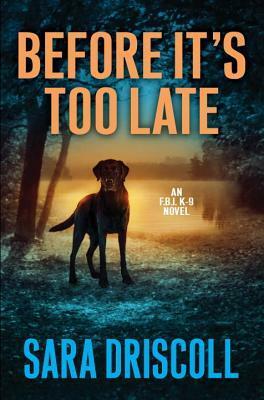 The FBI’s top cryptanalysts crack the code, and Special Agent Meg Jennings and her K-9 partner, Hawk, scramble to follow a trail of false leads to the scene of the crime. By the time they solve the puzzle, it’s too late. But the killer’s game is far from over . . . Soon another message arrives. Another victim is taken, and the deadly pattern is repeated—again and again. Each kidnapping triggers another desperate race against time, each with the possibility of another senseless death. That’s when Meg decides to try something drastic. Break the Bureau’s protocol. Bring in her brilliant sister, Cara, a genius at word games, to decipher the kidnapper’s twisted clues. Meg knows she’s risking her career to do it, but she’s determined not to let one more person die under her and Hawk’s watch. If the plan fails, it could bite them in the end. And if it leads to the killer, it could bury them forever . . .
One Week to the Release of BEFORE IT'S TOO LATE! 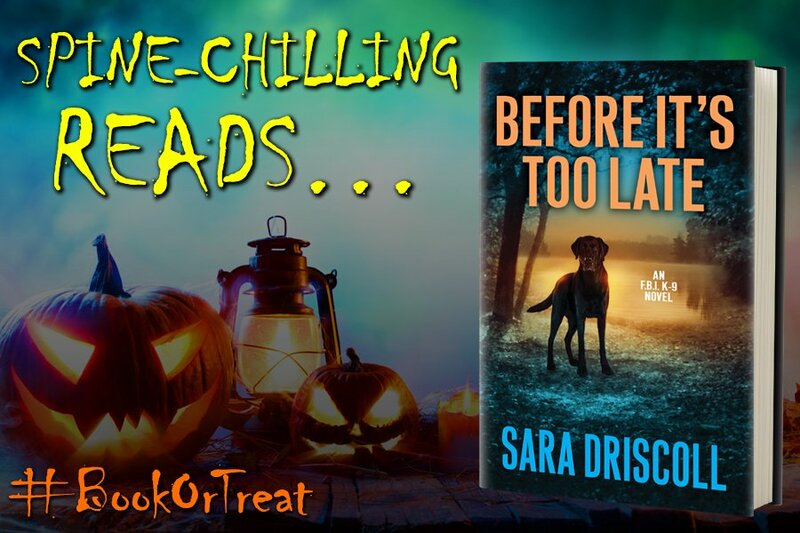 We’re only a week away from the release of BEFORE IT’S TOO LATE, the second book in the FBI K-9s and things are getting excited chez Sara Driscoll. So what’s going on? Yesterday, I was featured on Alli Sinclair’s blog highlighting the story behind the FBI K-9s series. Next Monday, September 25th, the day before the release, LONE WOLF is going to be the Kindle Daily Deal on Amazon, so it will be a great opportunity to try out the book that started the series for a cheap and cheerful deal price the day before the second book comes out. It’s the big launch on Tuesday, September 26th, then I’ll be on Joan Reeves’s Slingwords blog on the 27th, and finally I’ll be throwing a big launch party here in Burlington, Ontario on Saturday, September 30th (details at the end of this post). Whew! Going to be a busy few weeks! Stay tuned for more on September 26th! It’s time for a party! If you’re in the Greater Toronto Area, please join me for the launch of BEFORE IT’S TOO LATE! Things have been pretty busy around here in the last few weeks. We’re not only getting ready to release the newest FBI K-9s novel, BEFORE IT’S TOO LATE, in two weeks, but Ann and I have been putting the finishing touches on the third book in the series, STORM RISING, which went out to our critique team yesterday. Working on STORM RISING has been somewhat bittersweet lately. Earlier this year, when we planned the book to start with a brutal hurricane making landfall on the eastern seaboard, we never suspected we’d have two such hurricanes devastating parts of the United States while we were working on it. The research for STORM RISING was very heavily based on Hurricane Sandy, but both Harvey and Irma have confirmed everything we already knew in the worst possible ways. I’ve been watching the search-and-rescue K-9 teams sent in to Texas, Florida, and Caribbean islands, knowing how crucially important they are to the search efforts and recovering the missing. Our critique team is digging into STORM RISING now, but our readers will see it in the fall of 2018. I’m running a few Goodreads giveaways in the next few weeks, with the first starting yesterday. Are you a Goodreads member and would like to get your hands on a free, advanced copy of BEFORE IT’S TOO LATE? Then enter using the widget below. Do you want to get a sneak peak at BEFORE IT’S TOO LATE? I’m sending out a newsletter this week with an exclusive early look, so if you’re interested, sign up at the bottom on my home page. And, finally, I’m having a book launch! 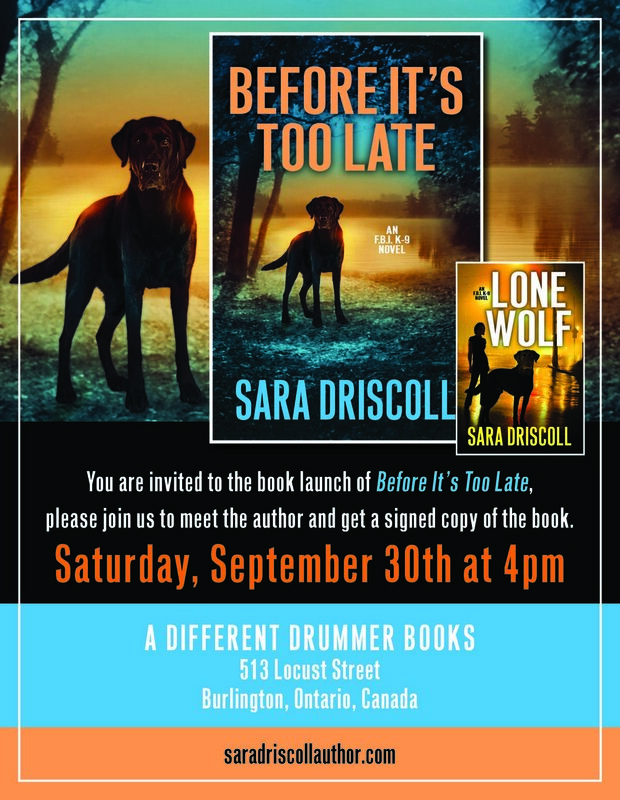 If you’re in the Greater Toronto Area in Ontario, and would like to have an author signed copy, please join me on September 30th at A Different Drummer. Hope to see you there! The headlines and videos of the aftermath of Hurricane Harvey are horrific. Historic flooding displaced over 30,000 residents, damaged or destroyed an estimated 200,000 homes, and has caused up to approximately $180 billion dollars in damage. On the short term, attention has rightly been focused on the 17,000 rescues that have taken place. When local law enforcement was unable to keep up with the calls for help, the public responded. Regular people, intent on simply saving lives, came from as far away as Florida bringing their own boats to put into the flood waters. People laid their lives on the line to save strangers and their pets. It’s been uplifting to watch these rescues and is a wonderful reminder that even during times of political chaos when every news story seems dark and foreboding, the human spirit continues to successfully rise to the challenge. 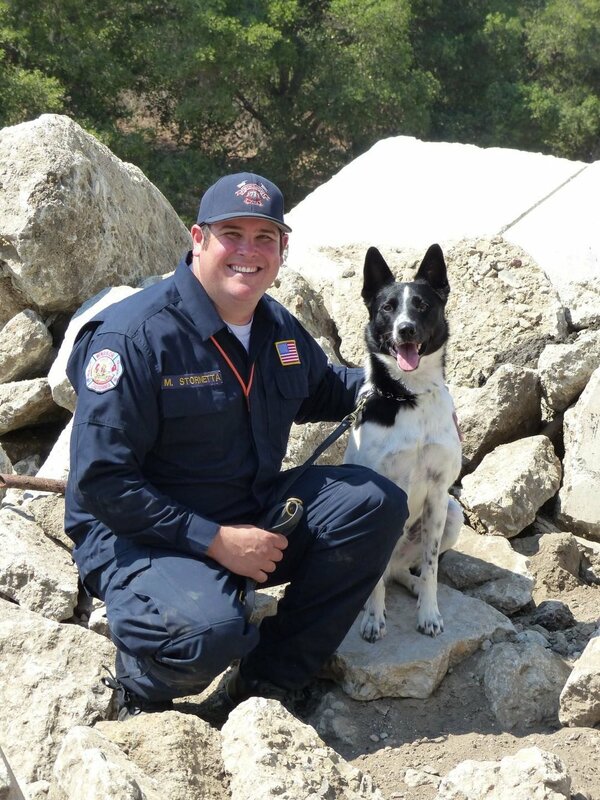 As in any natural disaster in modern times, search-and-rescue dogs have responded to Hurricane Harvey and will continue to do so over the coming weeks. The National Disaster Search Dog Foundation (SDF) had ten teams dispatched to their San Antonia base of operations or on their way the day the hurricane made landfall. Within days, another four teams were activated, bringing the total number to fourteen, with teams responding from California, Nebraska, Texas, and Utah. As the water receded, the teams moved in, looking for anyone trapped who had been missed by rescuers in the initial rescues. It's incredibly hard work for the teams, but there is no question that lives have been and will be saved because of their presence on the ground. A heartwarming story about one of the SDF search-and-rescue K-9s has recently come to light out of Harvey's news cycle. Rocket, a border collie, was nearly euthanized at a shelter for being too high energy. But an SDF canine recruitment volunteer recognized something special in Rocky. He wasn’t right for search-and-rescue, but he might make a good agility dog, so she and her husband, an SDF handler himself, adopted Rocket. Within a year, however, Rocket was showing signs of being an ace search-and-rescue dog, so the SDF took him on and partnered him with Windsor Fire Engineer Mike Stornetta. Now the dog that nearly died because of his energy and drive is now using those same characteristics to save lives in Texas. Mike and Rocket were deployed to Wharton, Texas, and have been doing grid searches of flooded houses in conjunction with other task forces. Sometimes, an intuitive eye is what it takes to change and save lives, and Rocket is a prime example of this. We wish Mike, Rocket, and the other teams on the ground in Texas the very best of luck. I have a newsletter! Interested in getting a sneak peek at the first few chapters of BEFORE IT’S TOO LATE before it launches later this month? Then just sign up at the bottom of the home page here on my website and you’ll be added to the list! More fun stuff coming in the newsletter such as cover reveals for the third book in the FBI K-9s series and Abbott and Lowell book #5, LAMENT THE COMMON BONES, as well as more sneak peeks, and early publishing news. Don’t miss out! 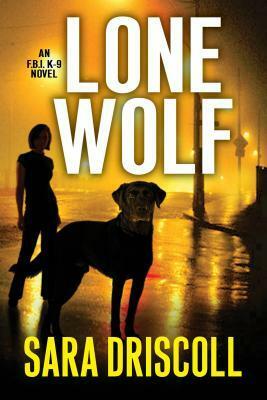 Before we start into today’s blog post, I just wanted to let you all know that LONE WOLF, the first book in the FBI K-9s series, is out today in mass market paperback. Prefer to read print and were curious about the series, but thought the hardcover was too pricy to try? This is your chance to jump into the series for a cheap and cheerful price. You can find it at local booksellers as well as Amazon.com, Amazon.ca , Amazon.co.uk, and Chapters.Indigo.ca. It’s a great time to jump into the series as BEFORE IT’S TOO LATE will be released in just four weeks! A recent news story caught my attention for numerous reasons. Not only did it involve a real-life search-and-rescue dog team, but it also involved drones. For those of you who have read LONE WOLF, you know we used drones as a method to deliver chaos and anarchy in the form of high-energy explosives, leading to death and destruction. But this story is quite different. The Swiss Association of Rescue Dogs (REDOG) was officially founded in 1971, but the use of mountain rescue dogs in Switzerland has been going on for centuries for avalanche rescues and to find missing climbers. Now one of the foremost rescue groups in the world, REDOG currently has 650 members and 500 active rescue dog teams, and is known for both it’s wilderness and urban disaster training. They deploy both nationally—where approximately 3,000 people go missing each year—and internationally, responding to natural disaster and missing person calls. Recently REDOG has teamed up with the Swiss Federation of Civil Drones and this combination uses the best skills of each group to facilitate searches. Drones—often pilot-controlled octocopters which can cover distances up to five kilometers at 100km/hour—are used to search mountainous terrain which would be unsafe for both the dog and handler, as well as being able to cover open spaces encompassing large areas with high definition visuals that are then reviewed by a search specialist. If a victim is found, rescuers are sent in to that specific location. If evidence of a victim is found, search-and-rescue dog teams can be dispatched for a more localized search. The benefits of the two groups working together is clear. Combined searches are more efficient and save time and resources overall, significantly cutting down average rescue times. In a turnaround from how drones were used in LONE WOLF, they are again used in our now drafted manuscript for the third book in the series. The book starts as we drop Meg and Hawk into a post-hurricane search-and-rescue mission, and it’s a shock for Meg to hear drones in the air when she’s been conditioned to recognize them as deadly. But in this case, as we are sadly seeing right now in Texas, drones can safely fly over flooded areas and can send back specific images to help pinpoint searches, potentially saving lives when time is of the essence. It’s been long recognized that the domesticated dog—known to many as man’s best friend—evolved from the wild wolf, but scientists are not clear as to when this might have occurred, and how many times. In a post last fall, we looked at the domestication of wild dogs approximately 15,000 years ago. But when did the ancestors of dogs evolve into the species we now know as Canis familiaris? There are two main schools of thought. One theory, published last year in the journal Science, looked at the partial genetic profiles of 59 dogs from 3,000 to 14,000 years old, as well as the complete profile of an Irish dog from 4,800 years ago, and compared these sequences to hundreds of modern dogs. This data suggested that domesticated dogs actually arose twice in completely separate events, once in Asia and once in Europe. However, a recent study published in Nature Communications suggests an alternate theory. This group studied two ancient German dogs, one 5,000 years old, and the other 7,000 years old. They combined these genetic sequences with those of the Irish dog used in the Science study, and compared them to the genetic makeup of 5,649 modern dogs and wolves. Based on the high degree of similarity between ancient and modern genetic signatures, their results conclude that dogs were domesticated from a now-extinct wolf population approximately 40,000 years ago, which then split into the European and Asian populations approximately 20,000 years ago. Some interesting additional details came out of this study. While wolves are carnivores, dogs developed the ability to digest starches, making them more omnivorous than their ancestors. Living with agriculture-based human populations, this was a huge advantage, and this ability appears to have evolved at roughly the same time as it did for humans. Also interesting, unlike their 5,000 and 7,000 year-old ancestors, modern dogs have developed duplicate genes, allowing them more genetic flexibility. So which of these two theories of canine domestication is correct? The researchers agree that the more recent study doesn’t preclude the possibility of a second domestication event; they simply don’t see evidence of such an event in their samples. Critics of this research point out that it doesn’t explain the huge divide between European and Asian subspecies, nor does it explain that while Europe and Asia were highly populated with dogs, the areas between were notably empty. Future research is planned to look at more ancient Asian dogs, more recent European samples—such as those from the time of the Roman Empire—and also American samples in a bid to narrow down the ‘where’ of domestication as well as the ‘when’. I’m back! Sorry the hiatus has been so long, but I had to have my head down drafting the third book in the FBI K-9s series. The great news there is that the first draft of the book is complete, but I’ll get into that more next week when I catch everyone up as to where I am now and outline my schedule for the fall. Today though, I have a really fun infographic to share. The nice folks at Rover.com contacted me and asked if I’d like to share this infographic with my readers. And because so many of you are dog owners and lovers, I thought it might be a fun post as I’m ramping back into my regular blogging routine. There are some points that definitely ring true for me. How about you? Since the early 1980s, forensic anthropology research centers have been crucial to our knowledge surrounding human death and decomposition and their contributions to the scientific field have allowed for decades of successful criminal investigations. Leading the field is the original facility, the University of Tennessee at Knoxville’s Forensic Anthropology Research Center, better known by its original name, The Body Farm, a catch-all term that now applies to all similar research centers. Years ago, Skeleton Keys blogged about both the Body Farm and Dr. William Bass, the man who started the farm in 1980 with its first research subject arriving in May of 1981. Both law enforcement and the scientific community owe Dr. Bass a debt of gratitude for his efforts to dramatically expand an area of science that was just in its infancy. Since the original body farm, a number of other American facilities have opened: the Forensic Osteology Research Center (FOREST) at Western Carolina University in Cullowhee, North Carolina; Texas State University-San Marcos’s Forensic Anthropology Center at Texas State (FACTS); the Center for Biological Field Studies at Sam Houston State University, near Houston; the Complex for Forensic Anthropology Research (CFAR) at Southern Illinois University in Carbondale, Illinois; and the Forensic Investigation Research Station (FIRS) at Colorado Mesa University in Grand Junction, Colorado. A quick scan of the existing body farms reveals a significant issue: they are overwhelmingly situated in the southern United States. Since environment and climate play a crucial role in human decomposition, this has a major impact on results and leaves a large gap in our knowledge base. Enter the newest facility to open at Northern Michigan University in Marquette, Michigan. Recently, Michigan’s governor has granted the university 2.5 acres of land adjacent to the Marquette Branch Prison to open a facility that will focus on the yet-to-be-explored issues of freezing, thawing, and weathering of victims in northern climes. As important as human decomposition research is, it’s often difficult to find sites in a community to house what can often be an aromatic outdoor laboratory, and people are often uncomfortable knowing that research on human remains is going on nearby. What they may not realize is that many people donate their own bodies following death to these facilities specifically, knowing that they would be contributing to important research, and that all human remains are treated with respect and dignity. Living in Canada myself, I see this research as being incredibly important and that it will only strengthen the legal and law enforcement community’s drive to find justice for victims of lethal crimes when they can’t speak for themselves. We wish them luck in their new venture. Blogging over the next little while is going to be somewhat sporadic for us. We’ll be back whenever we have news about our upcoming release BEFORE IT’S TOO LATE, but we need to buckle down and concentrate on writing its sequel, the third book in the FBI K-9s series. As a result, the blog will be a little quiet for the next 4 or 6 weeks, but we’ll be back full time as soon as the first draft is complete. See you soon! Fingerprints have long been one of the cornerstones of forensic crime scene analysis. 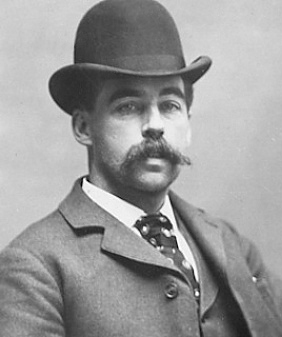 From their early use in the late 19th century, to their first role in a murder conviction in New York in 1902, to their standard use as we know it today, fingerprints and their analysis have become crucial tools for investigators in their pursuit of criminal justice. Where some other techniques have come into question—such as bite mark analysis—fingerprints have always been considered reliable. There are surfaces that prove problematic, or visualization techniques may not be powerful enough, but the concept of the ability to match a single individual to a single print has never been shaken. Fingerprints are, in essence, biological traces left by individuals marking their contact with a surface. As Matt Lowell put it in TWO PARTS BLOODY MURDER, a fingerprint is “an organic slurry of amino acids and fats with some inorganic compounds mixed in” we leave behind when we touch a surface. Patent prints are left when a substance is transferred by a finger, leaving a visible print behind i.e. ink or paint. Latent prints are invisible impressions of the slurry Matt describes that need to be processed to be visualized, and are the majority of the prints law enforcement deals with. Fingerprinting can be a difficult endeavor as a pristine, complete print is rarely deposited. Instead, prints overlap, only consist of a partial impression, smear or smudge, or are a mixture of different individuals. Adding to that is the composition of the surface the print is on, the age of the print, and the type of processing involved. It’s a complicated process, but when it works well, the answer is definitive. A paper was recently released discussing how latent prints change over time, and how they change shape and can actually migrate over certain surfaces. Over time, any fingerprint will lose water content and the bulk of the print ridges will decrease. But it was the placement and positioning of those ridges that was the key to this study. Some surfaces do not maintain fingerprints well—prints on certain types of plastics will disappear in about four days, where a similar print on glass will remain for months. Porous surfaces such as paper and wood absorb some of the oils and are excellent matrices for locking the print into place. But some materials actually allow the print structure to change as the ridges decrease in height, but increase in width, while the space between the ridges increases. In essence, the print spreads laterally, migrating outward, covering up to 140% of the original surface in just over a week. However, given sufficient time—up to eight weeks—the print will contract, eventually only taking up 69% of the original size. How does this kind of migration affect a print in a criminal investigation? The authors suggest that this kind of print expansion and contraction could be responsible for a number of the print mismatches that still occur today. They also suggest that if a timetable of migration could be determined, digitized prints could be reverse-aged back to their original structure, which would allow for direct comparison to fresh suspect prints. The authors have suggested this technique would be particularly useful on new polymer banknotes which are already proving a challenge for traditional fingerprinting methods. This technique could prove to be beneficial as it could help investigators overcome a significant problem with fingerprints—a timeline. The presence of a print linked to an individual is a crucial piece of information. But knowing when that print was deposited—yesterday, last week, or last month—could be the difference between a suspect who was in the room at the time of a murder, or a week before, when the victim was still hale and healthy. A New Complication in Determining Time Since Death? In the last few weeks, a few forensics stories have broken, each taking an odd angle on what has previously been considered a tried and true forensic practice. We’re going to look at the first of these stories today. Determining time since death in an unwitnessed death is a crucial part of any investigation, especially if the death is suspicious. In order to obtain an alibi, investigators need to know approximately when the death occurred so they can determine a suspect’s whereabouts at that specific time. There are multiple ways to determine recent time since death, including the extent of rigor mortis (the stiffening of the body’s muscles up to approximately 12 hours after death), lividity (the settling and pooling of blood due to gravity), and a decrease in body temperature. The human body normally functions at 37oC/98.6oF, but after death, with the body’s process of homeostasis interrupted, the body will cool until it reaches the temperature of its surroundings. By and large, the body will cool at a rate of approximately 2oC/3.6oF for the first hour postmortem, and then 1oC/1.8oF thereafter until it reaches ambient temperature. But there are a host of other complicating factors including extreme ambient temperatures, body position, whether it is clothed, humidity levels, fat content of the body, thermal conductivity of the surface beneath the body, and any disease that might raise the body’s resting temperature at the time of death. It’s a complicated set of conditions, but the key factor is that normally a body only cools; it doesn’t warm up after death. An interesting paper was recently published in the Journal of Forensic Medicine and Pathology detailing a case of postmortem hyperthermia—a rare occurrence where the body temperature actually rises after death. The research team followed the case of a man who died in a Czech Republic hospital from heart failure. Hospital protocol required the deceased remain on the ward for two hours after death. An hour following death, as hospital staff started to prepare the body for transport in another hour, they noticed that the body was radiating heat and started to monitor temperature. An hour and a half after death, the body hit a maximum temperature of 40.1oC/104.2oF. Four hours following death, the body was still above normal at 37.6oC/99.7oF, but it then continued to cool as expected. The ramifications of postmortem hyperthermia are clear—if it happened following a suspicious death, it would offset the time since death estimation by a number of hours (in this case, approximately 4 hours). For instance, if a murder happened at midnight, the person found dead at 6am might be assumed to have been alive until 4am. This could have serious repercussions as the killer could have a watertight alibi for four hours after the actual time of the murder, and the window of time around the murder itself would never be questioned. Currently, there is no way to predict this drastic postmortem change in body temperature, but researchers are trying to identify circumstances that might lead to this reverse temperature cascade. Several causes for postmortem hyperthermia have been raised. Intoxication or drug overdoses may cause it. Violent deaths leading to brain trauma giving rise to cerebral oxygen deprivation or asphyxiation can be responsible. Low voltage current electrocution, heart attack, fever, or cancer can all result in hyperthermia at the time of death which could be mistaken for postmortem hyperthermia. Researchers hope to study more cases to be able to provide additional reasons for this often mysterious condition. So where does this leave investigators? Should they question every time since death estimate? Postmortem hyperthermia certainly raises the argument that multiple metrics are required to inform investigators of an accurate time since death. Using other physical factors is the only way to ensure that in the absence of a witness, the accurate time of a suspicious death is established, giving investigators their best chance to find the individual responsible. Ann and I are currently in the research stage of our new FBI K-9 book (#3!) and are just about to start outlining. We’re right on schedule to be writing by May 1st, aiming for a completed draft by the end of July. I had an interesting conversation with my mother yesterday. Mom has been a bit laid up with a bum knee lately that has required more of my time than usual making sure that she could manage meals etc. Mom, in turn, has been more on top of my writing than usual, making sure that I’m staying on schedule. So, she knows more about the direction of this book than she usually does at this stage. Some of the research I’ve been doing for this book is, frankly, hard. It’s difficult material, highlighting a darker side of society, one I’ve never had any experience with personally. When we were talking about it yesterday, Mom commented on some of the movies my older brother has considered (Mychael Danna, composer for movies such as Life of Pi, Moneyball, Capote, and others), and how he’d turned some of them down when the content was particularly brutal, especially when the movie portrayed a true story. It made me realize that I have a level of control in my art that isn’t possible in his. Yes, his music gives his movies a punch that is sometimes conveyed more emotionally than the written word, but he has no control over the story. 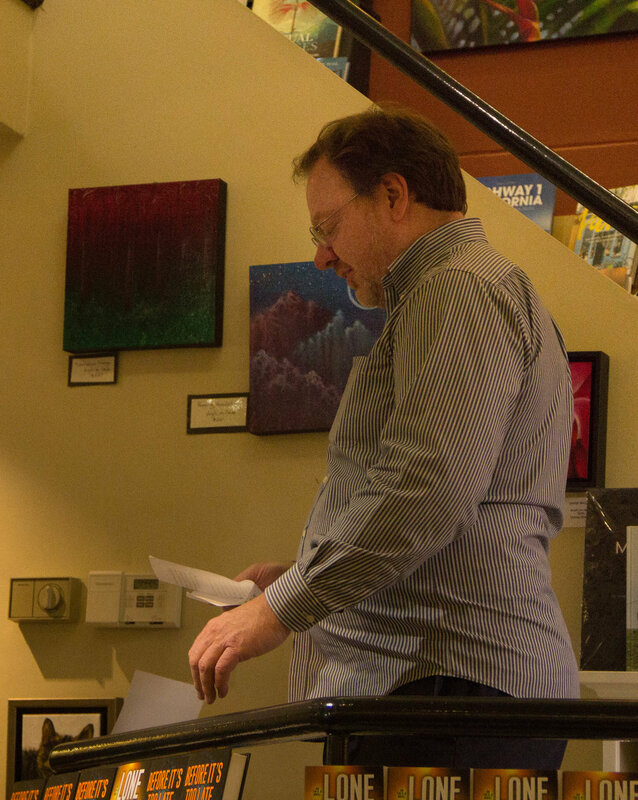 His film compositions are strictly reactive—he scores the combined vision of the writer and the director. Conversely, authors are proactive—the story is literally in our hands. It made me realize how lucky I am. In a world which seems increasingly uncertain and where the common person has basically no control—i.e. the current chaos in America, as well as the looming specters of Russia, Syria, North Korea—writing allows an author the privilege of being in charge. So, when my mother commented on the darkness of that major aspect of the storyline, my response was that we would have the satisfaction of seeing justice done and of good trouncing evil. Honestly, there’s enough bad in the world that I don’t need to come out of a book feeling even more downtrodden (and I’m sure other readers feel the same), let alone immersing myself in that kind of storyline for months while I’m writing it. So, we get the luxury of seeing the kind of justice we’d like to see in the world if it were a more perfect place. Now, that doesn’t mean it’s going to be a straight plot line, or that the characters will have an easy time of it—where's the fun in that?—but that just makes the win at the end that much more satisfying. It certainly is a known fact that reading tastes tend to change depending on the political/world climate. Most of the time dystopian fiction tends to flourish when the world monetary markets are stable. However, interestingly, as the American government has moved to a more authoritarian stance, dystopian novels such as 1984 and The Handmaid’s Tale have become more relevant and popular as readers are looking for parallels between the current administration and their world, and these fictional dystopian worlds of yesterday. Where do you stand on it? Are you finding your own reading habits leaning in the direction of happier endings right now because just watching the news is enough to give you a stress-related ulcer? Or do you find comfort and relevance in dystopian worlds as we try to navigate through the uncertainty of our own times?